Loosely based in Dr. Seuss' 1971 children's book of the same name, the movie takes place in Thneedville, a city that made of plastic with no living plants in it all. We follow 12-year-old boy Ted (Zac Efron) in his quest to impress the girl he has a crush on, Audrey (Taylor Swift), who dreams of seeing a real live tree. His grandma Norma (Betty White) tells Ted to seek out the Once-ler (Ed Helms) who knows about what happened to all the the trees. Ted manages to sneak out of the city and find the Once-ler who tells him the story of the Lorax and the disappearance of the Truffula trees due to corruption and greed. Now it might be up to Ted to bring back the trees and show people to care again but Mr O'Hare (Rob Riggle), the most powerful man in the Thneedville (and who looks an awful lot like Enda from the Incredibles) will do anything to stop Ted from ruining his plastic paradise. The animators did a great job bringing the world of the Lorax to life. I loved how the Truffula trees, Bar-ba-loots, Swomee-Swans and Humming-Fish were animated. The trees look so fluffy and soft and the Bar-ba-loots are insanely cute! I'm not sure about the Lorax though. I kind of completely missed his purpose. He was a little annoying and I didn't like the jokes he made. Still the movie was great and the children in the audience liked it. 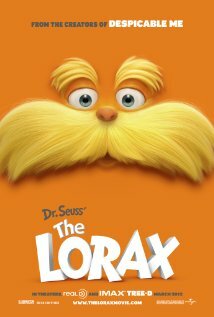 The Lorax is in theatres today, on Dr. Seuss' birthday! Go bring the family and see it!